After Columbus brought news of the new world to Europe many people went to the new world in search of land and riches. The Spanish Conquistadors were some of the first men to travel to the new world. They got their name from being both conquerors and explorers. They were mostly in search of gold and treasure. Cortes was one of the first Conquistadors. He was responsible for conquering the Aztec Empire and claiming Mexico for Spain. In 1519 he took a fleet of ships from Cuba to the Yucatan Peninsula. There he heard of the rich Empire of the Aztecs. In search of treasure Cortes made his way inland to the great Aztec capital Tenochtitlan. He then proceeded to conquer the Aztecs and kill the Aztec Emperor Montezuma. Pizarro explored much of the west coast of South America. In 1532 he conquered the great Incan Empire of Peru and killed the last Incan Emperor, Atahualpa. He took over the Incan capital of Cuzco and established the city of Lima. He also gained huge amounts of gold and silver. In 1511 Balboa founded the first European settlement in South America, the city of Santa Maria de la Antigua del Darien. 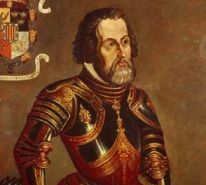 Later he would gather together Spanish soldiers (including Francisco Pizarro) and make his way across the Isthmus of Panama. He became the first European to see the Pacific Ocean. Ponce de Leon sailed with Christopher Columbus on his second voyage. He stayed in Santo Domingo and soon became governor of Puerto Rico. In 1513, exploring the Caribbean, searching for gold and the legendary Fountain of Youth, he landed on Florida and claimed it for Spain. He died in Cuba from wounds received while fighting Native Americans. Hernando de Soto's first expedition was to Nicaragua with Francisco de Cordoba. Later he traveled to Peru as part of Pizarro's expedition to conquer the Incas. In 1539 de Soto gained command of his own expedition. He was given the right to conquer Florida by the King of Spain. He explored much of Florida and then made his way inland into North America. He was the first European to have crossed west of the Mississippi River. He died in 1542 and was buried near the Mississippi. The Conquistadors often fought each other. It was Francisco Pizarro who arrested and framed Balboa for treason. Balboa was wrongly beheaded as a result. Then Pizarro was killed by one of Cortes' captains while in Peru in order to steal his gold and treasures. Hernando de Soto sided against Francisco de Cordoba and Cordoba was killed. Many of the Conquistadors came from the same area. Pizarro, Cortes, and de Soto all were born in Extremadura, Spain. Tribes hostile to the Aztecs helped Cortes in conquering the Aztec Empire. Many Native Americans died because of diseases brought by the Conquistadors and the Europeans. Diseases such as smallpox, typhus, measles, influenza, and diphtheria are estimated to have killed over 90% of the Native Americans within the first 130 years of the arrival of Europeans.